I wasn't happy with this cat, so it's getting a makeover! Sneak peek! I'm working on lots of Halloween stuff!!! ???? 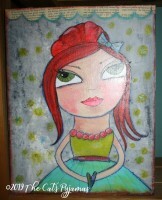 I am an artist specializing in mixed media paintings and cloth dolls. My paintings start with acrylic paints, then I use a combination of oil pastels, watercolors, colored pencils, ink and/or papers and found objects. My cloth dolls usually start as plain muslin. After sewing and stuffing them, I use stains, paints, oil pastels, found objects and new and vintage fabrics. Most of my doll hair is sheep's wool that I've dyed in my studio. I open my studio to the public in October and December, or you can call or email to set up an appointment.